I’ve been wanting to make cioppino for awhile. It’s a hearty fish stew that is typically thought to be of Italian origin, but it actually comes from the great American city of San Francisco. Traditionally, cioppino is made with several kinds of fresh seafood cooked in a tomato-white wine broth, and always accompanied by hot, crusty bread—usually sourdough or a baguette. 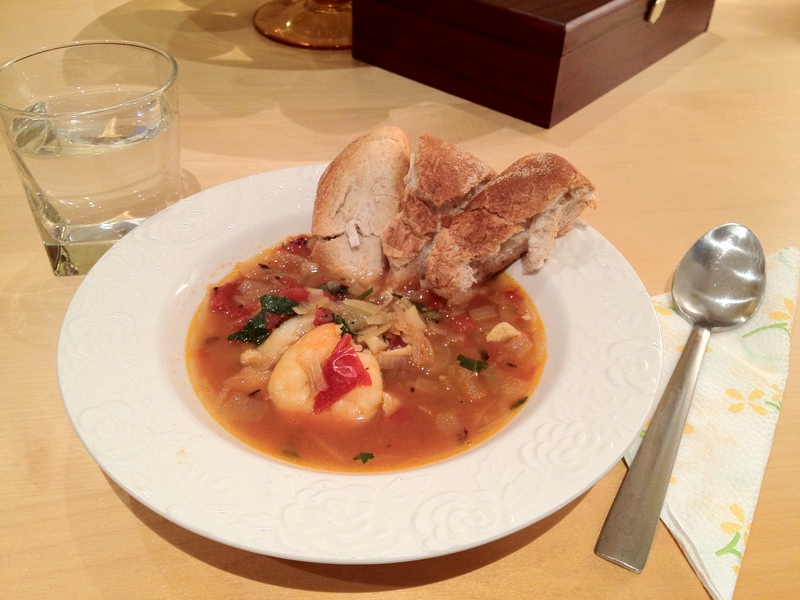 This recipe is a simplified version of cioppino, courtesy of Mark Bittman. It requires about a pound and a half of fish (any combination you like), fish stock and a pinch of saffron—an expensive ingredient, yes, but a little really does go along way. Once you’ve prepped your ingredients, the dish takes about 15 minutes to cook (which is probably why he calls his recipe Lightning-Quick Fish Soup). I made it using two fish I had on hand: shrimp and cod, which not only work fabulously but are also reasonably priced. Be sure to work with fresh or fully defrosted fish (you don’t want to work with anything pre-cooked or frozen). If you don’t have saffron, you can always add some more smoked paprika for a flavor boost—though it is worth pointing out that nothing flavors like saffron except saffron. It is that special. Set a large, deep pot over medium high heat; add olive oil & swirl to coat. Add the onion and garlic and cook, stirring occasionally, for 4 minutes. Turn the heat down if you notice the garlic browning. Add the chopped tomato, a dash of salt and pepper and cook another minute. Add the stock, paprikas, and saffron and turn the heat up to high. Cover and bring to a boil. Remove cover, reduce the heat to a steady simmer and let cook for 5 minutes. Add the fish, stirring, until it cooks through—about 5 minutes. Garnish with the parsley and drizzle just a touch of oil over each bowl of stew. Serve with freshly toasted bread. This soup will keep up to 2 days in the fridge. Reheat on the stove over low heat and let it simmer for 3-5 minutes before serving. 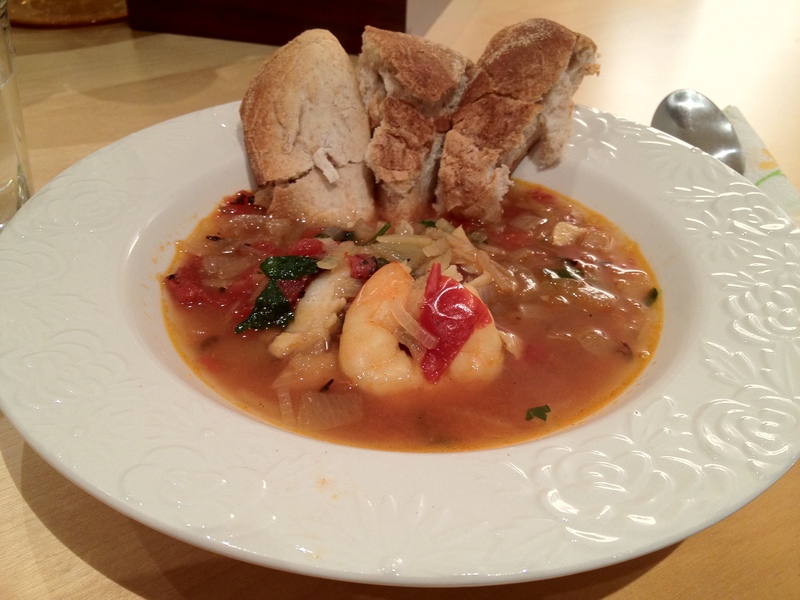 This entry was posted in Recipes, Savory and tagged cioppino, easy, fish, healthy, hearty, low fat, mains, mark bittman, photo, quick, recipe, seafood, soup, stew, stock, winter. Bookmark the permalink.